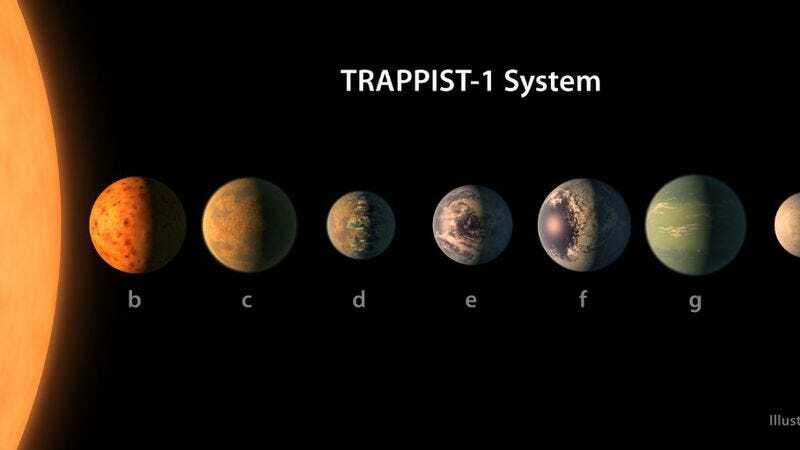 Between the latest Donald Trump inflammatory tweet and that embarrassing Oscar mishap, there was a brief moment of joy when NASA announced that it had discovered a system of seven Earth-sized planets 40 light-years away. The TRAPPIST-1 announcement was accompanied by illustrations of those seven new worlds. And while some might’ve assumed the images were an accurate representation of the TRAPPIST-1 system, they’re actually just an artistic rendering of planets that will remain a visual mystery for decades to come. Now this new piece from The Atlantic digs into the origin story of those eye-catching images. But as it often does when it wants to make an announcement more accessible to the general public, NASA commissioned artists to draw visual representations of the largely unknowable. In this case, two men were responsible for the TRAPPIST-1 drawings. Tim Pyle is a former animator who has worked on shows like Invader Zim, Jimmy Neutron, and SpongeBob SquarePants, while Robert Hurt is an astronomer with an interest in art. They’ve worked together in Caltech’s Infrared Processing And Analysis Center for 12 years, translating NASA data into comprehensible visuals. After seeing the TRAPPIST-1 data, Pyle and Hurt created a “plausible model” of the planetary system, which was then vetted by other astronomers. The Atlantic article digs into the specific choices the duo made when it came to illustrating the look of each planet. Using celestial bodies in our own solar system as a guide, they determined which planets would be most likely to have water, which would be ice worlds, and which would be rocky. In the end the final images offer a mix of scientific accuracy and visual interest. You can learn much more about the process, including the role marbles played in it, over on The Atlantic.